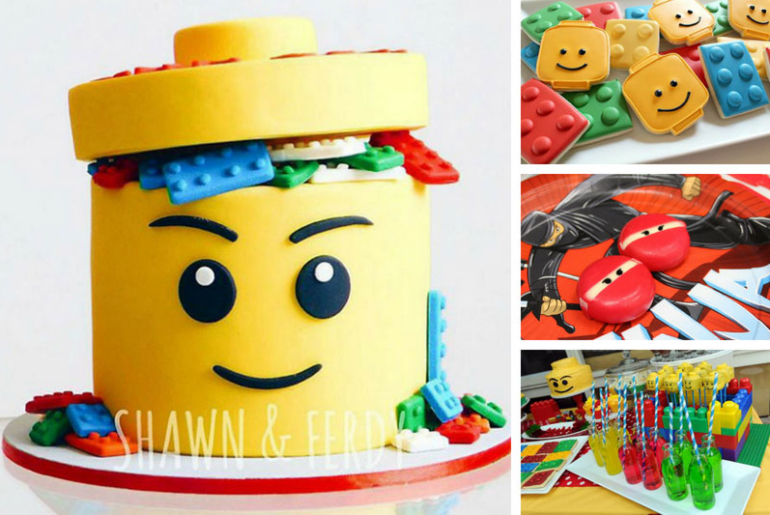 18 Fun Lego Party Ideas and Yes, Everything is Awesome! A Lego-inspired party will knock the building block socks off your birthday kid – and their guests! 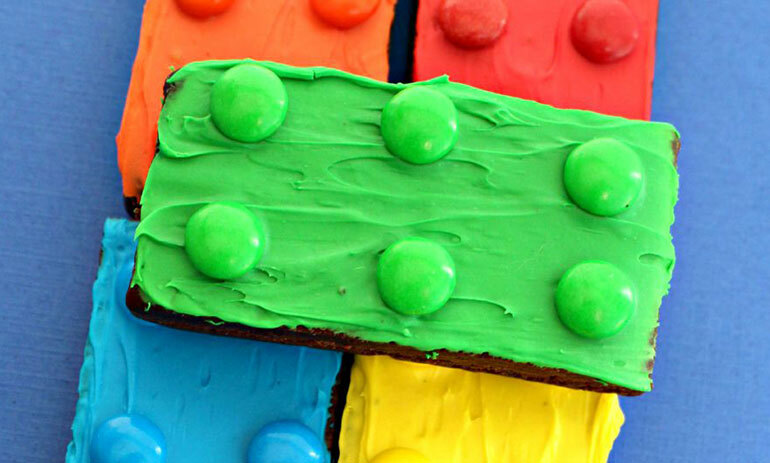 Get ready to have some fun in the kitchen – here’s your instruction manual to 18 Lego themed party foods. 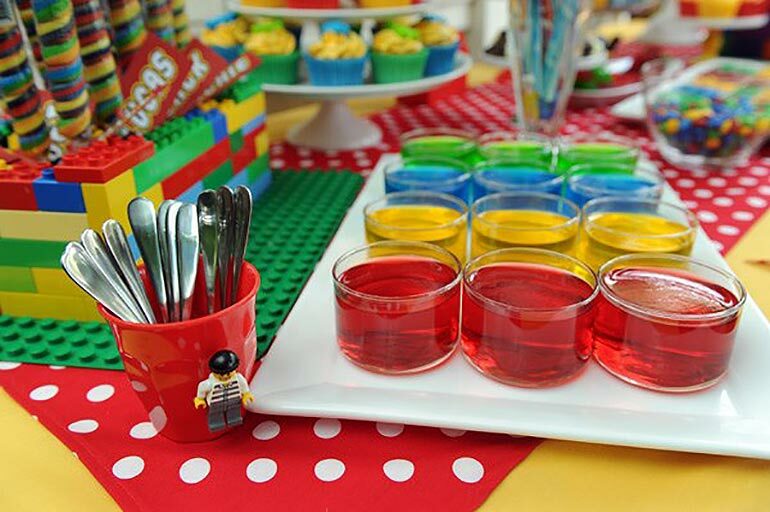 It’s all about the primary colours with these Lego party ideas. If your little one is more into the Lego Friends range, change it up for pastels instead. Classic or pastel coloured – just like the Lego Movie, everything is awesome. 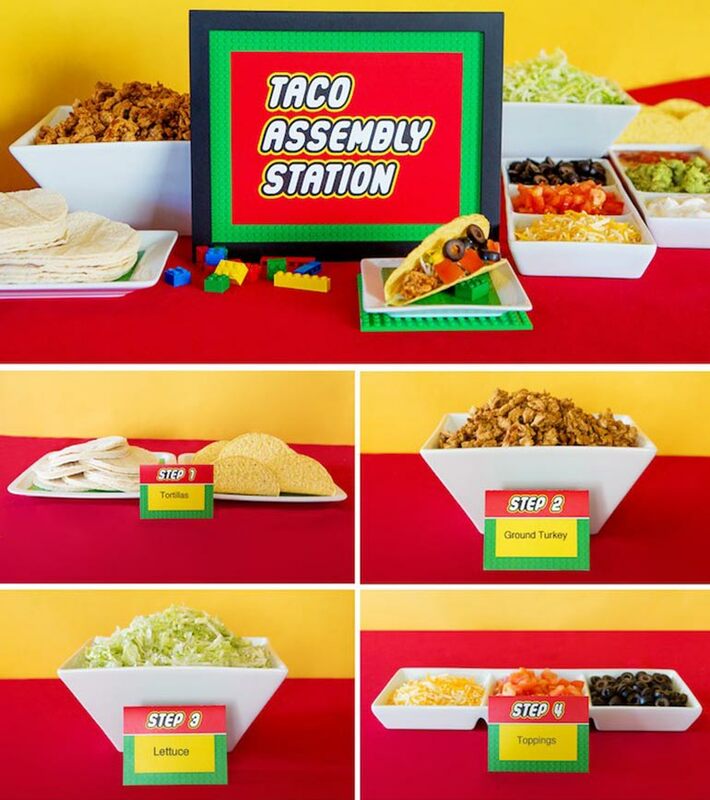 Without further ado, let’s get started on building your Lego party menu! The Lego themed birthday cake is perfectly executed with yellow fondant. 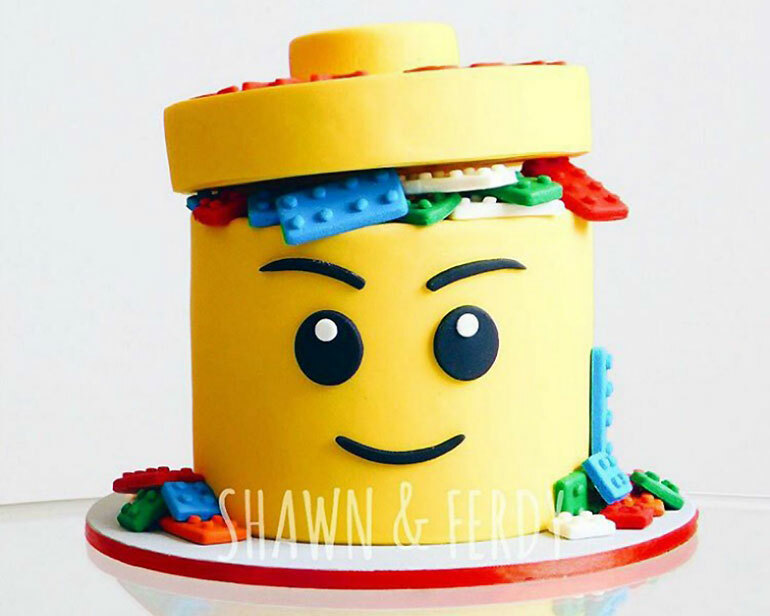 This Lego head created by Shawn and Ferdy, is beyond awesome. If fondant’s too hard, it’s okay to cheat with buttercream. 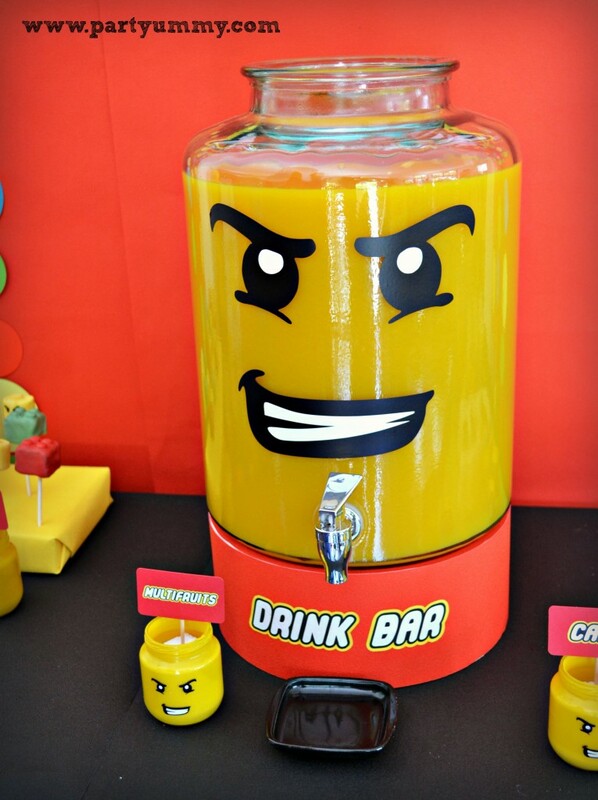 Fill a drink station with an orange or yellow drink (juice or cordial) and give it a Lego makeover by painting or applying a Lego face decal to the exterior. Go the extra mile and draw or paint Lego faces on clear plastic cups too. 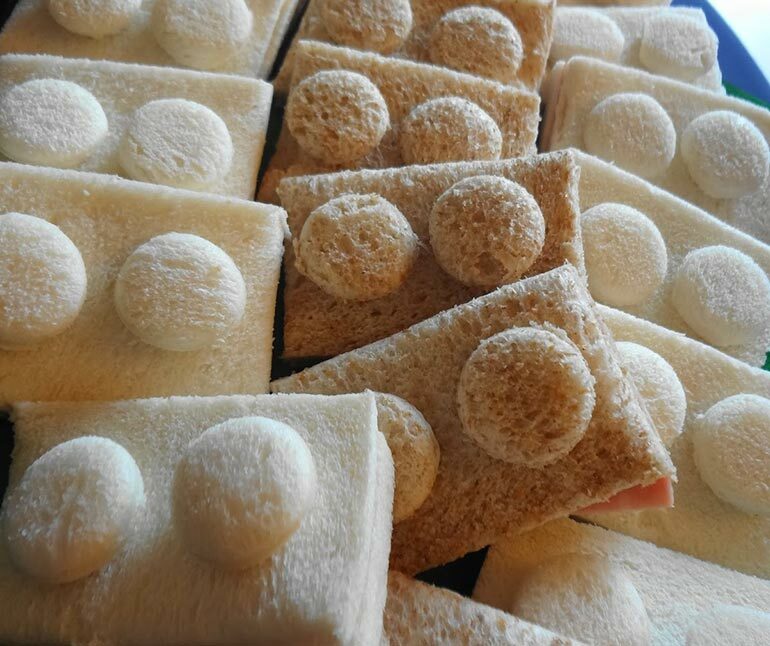 Don’t let boring sandwiches ruin the vibe at your Lego party! Try these sandwich bricks on for size. A cookie cutter is all you need and cream cheese to glue the brick nubs on top. A bucket of mini Lego heads is only a bag of marshmallows away. 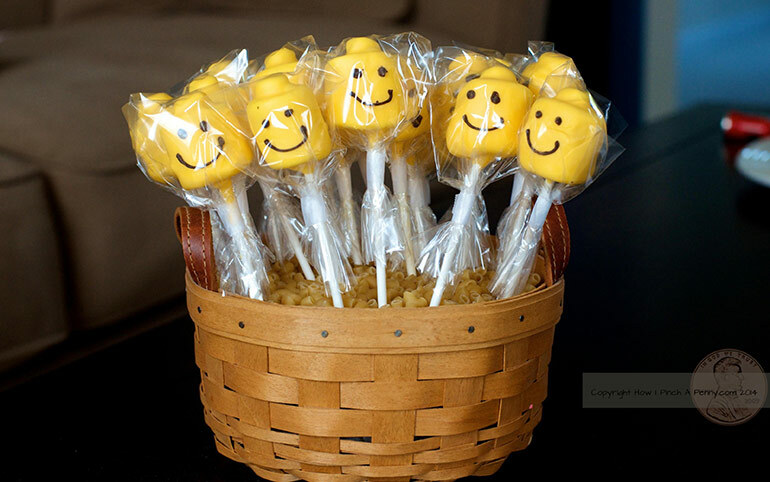 Marshmallow Lego pops make a sweet (and very yellow) party favour for kids to take home. Perhaps don’t let them eat it in the car. 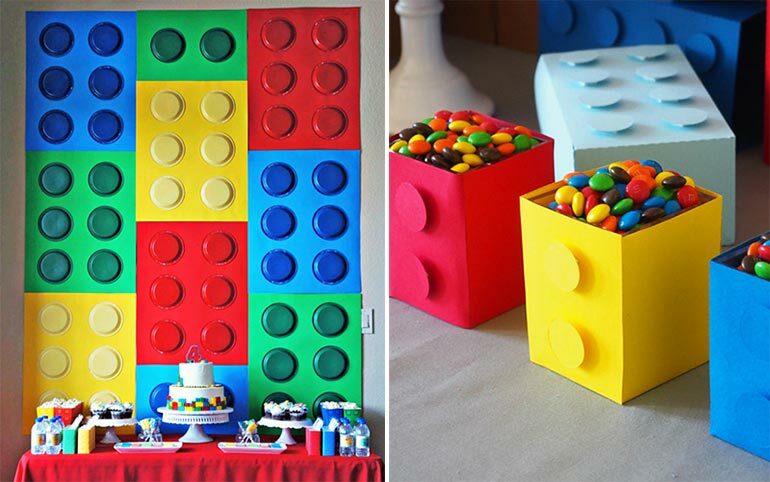 Lego party ideas don’t come more fun than this! 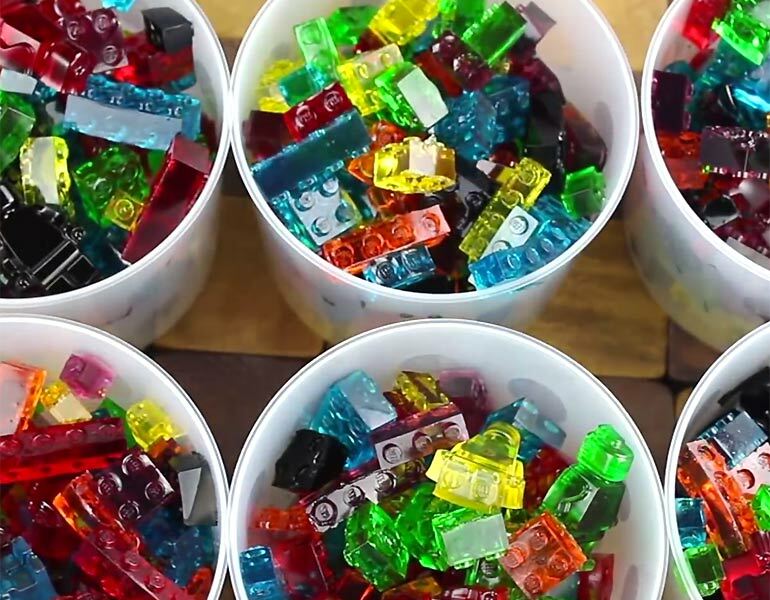 Make your very own edible, gummy bear style Lego blocks and Minifigures, just like these colourful ones. Fancy pants! Does the kid love Lego Ninjago? 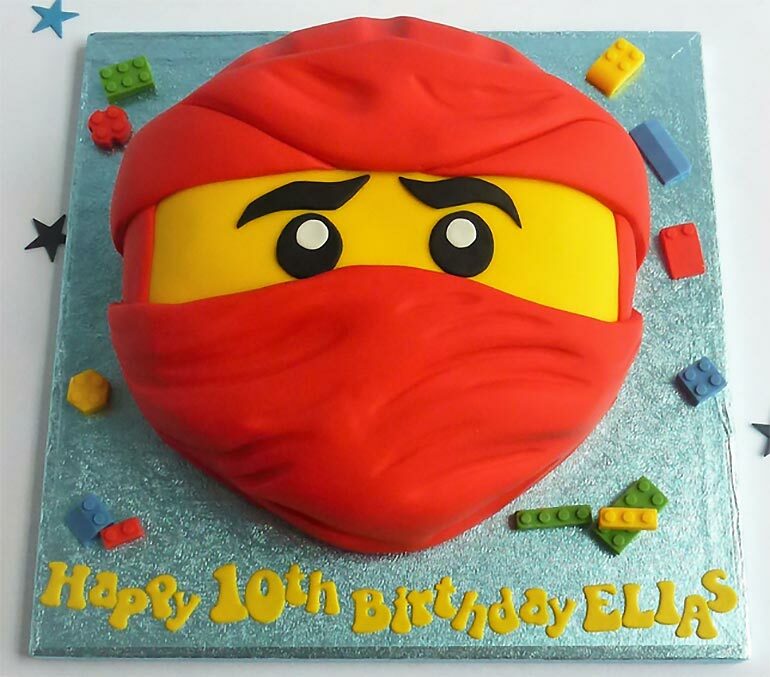 Here’s a fab fondant covered Ninjago birthday cake to inspire you! 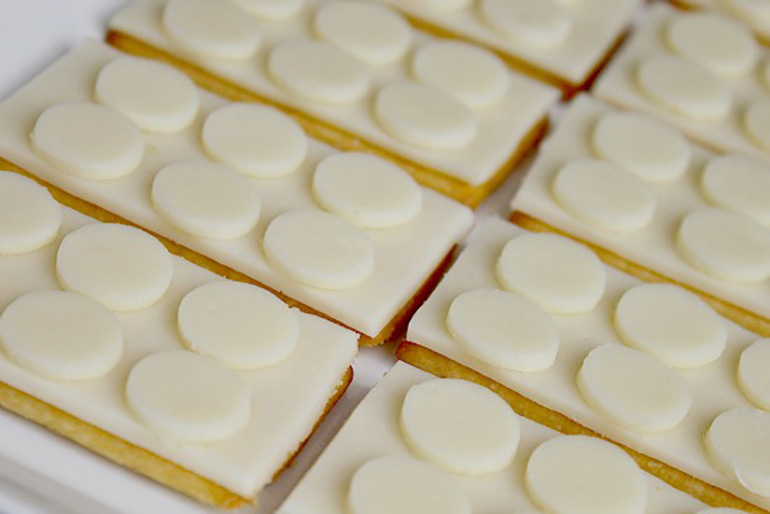 These crackers and cheese couldn’t be any more Lego-fied if you tried. So cheesy, so delicious, they deserve a spot on every Lego party ideas list. How’s your sugar biscuit game? 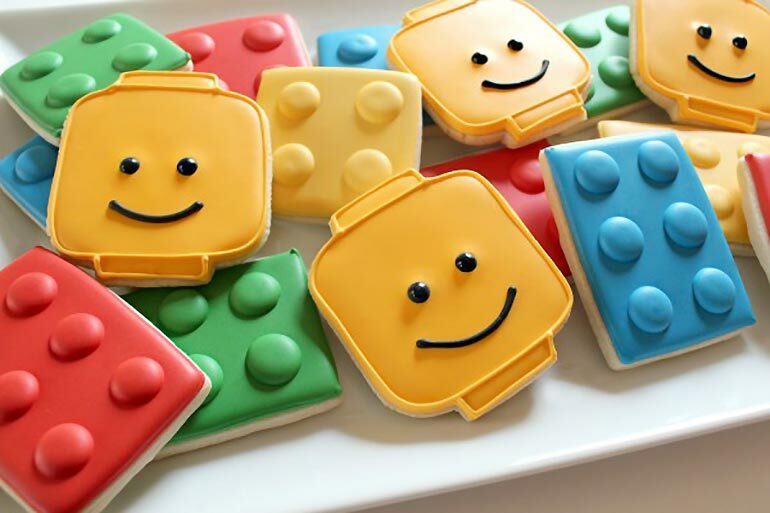 Have your royal icing at the ready for this spectacular plate of Lego themed sugar biscuits! Yellow Lego head jelly cups are a cinch to create with a packet of lemon jelly and clear plastic cups! Lego brownies? You bet! Iced and topped with crunchy chocolate buttons. The most delicious building bricks you’ll ever eat. 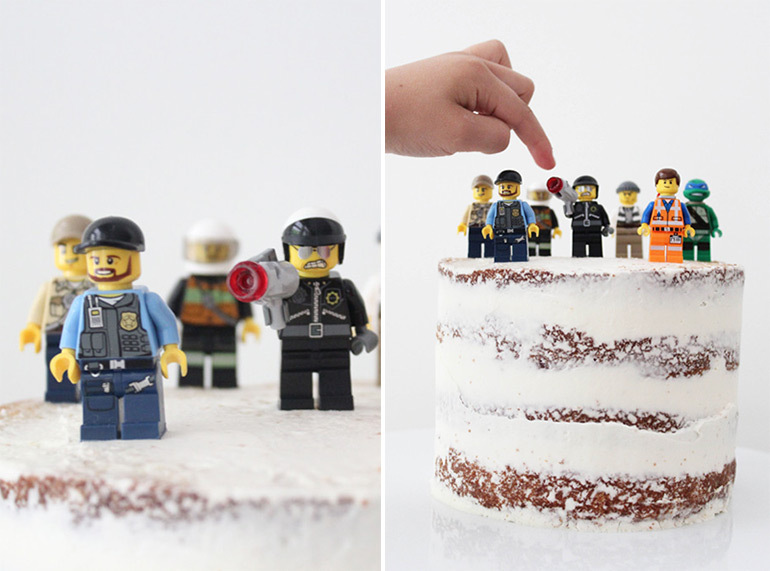 If you want a REALLY easy option for decorating the cake – simply ice it and top it with Lego Minifigures, so sweet! So cute and easy! 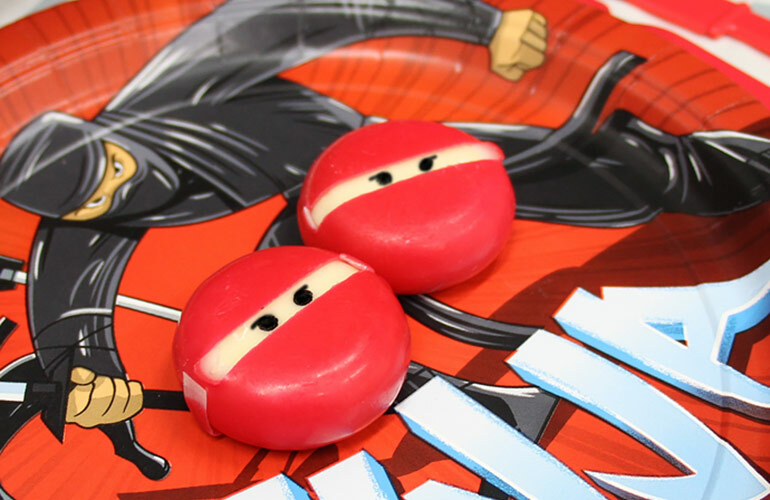 You too can turn a bag of Babybel cheese wheels into epic Lego ninjas with some careful unpeeling of the waxed exterior and a food marker. Build your favourite tacos at a taco building station. Print off the instructions, prop up against the bowls of filling and off you go! Hot tip: Place taco mince in a slow cooker to keep it at a food-safe temperature. You can even put a Lego inspired spin on fruit. 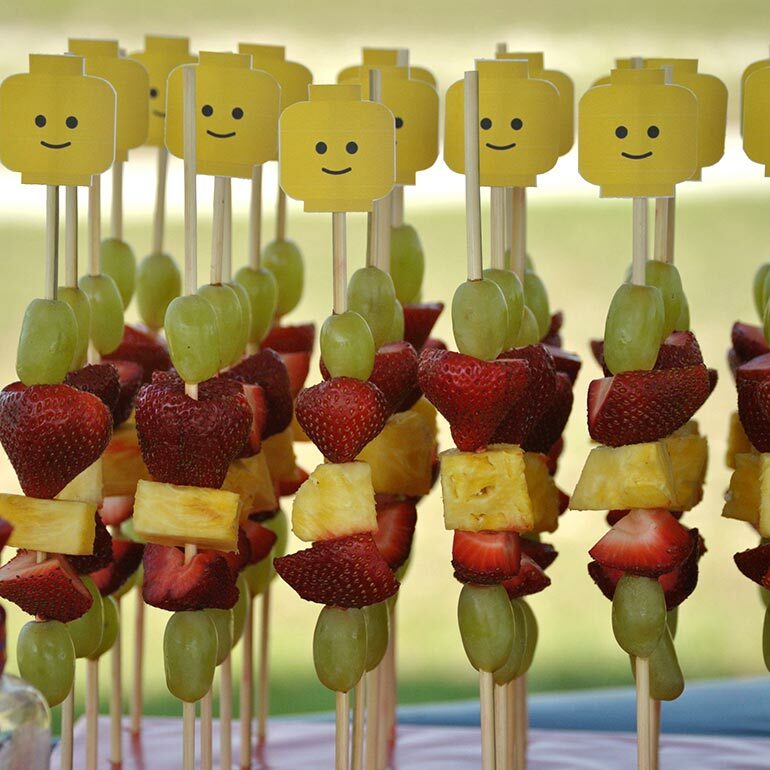 Ditch a traditional fruit platter in favour of Lego head fruit kebabs! 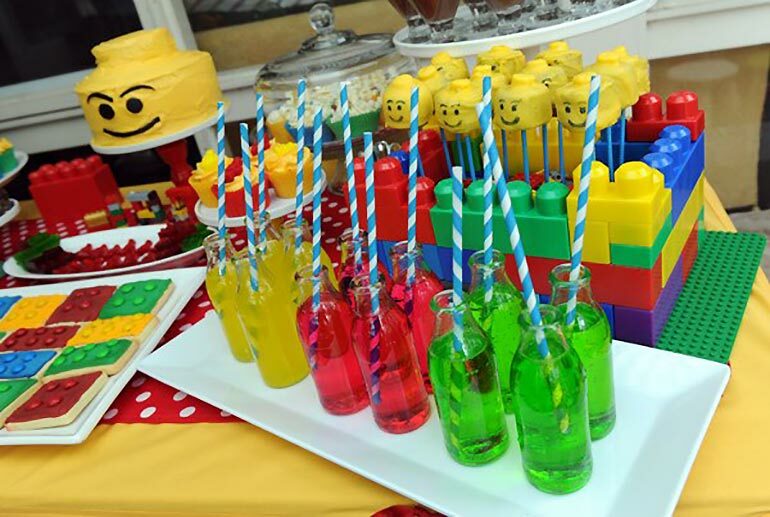 Our very own Mum Central editor Nikki nailed the Lego party brief for her son with this delicious spread, including multi coloured jelly cups and bottles of coloured lemonade. Deeeelicious. The Lego fun doesn’t stop at jelly cups, no siree! 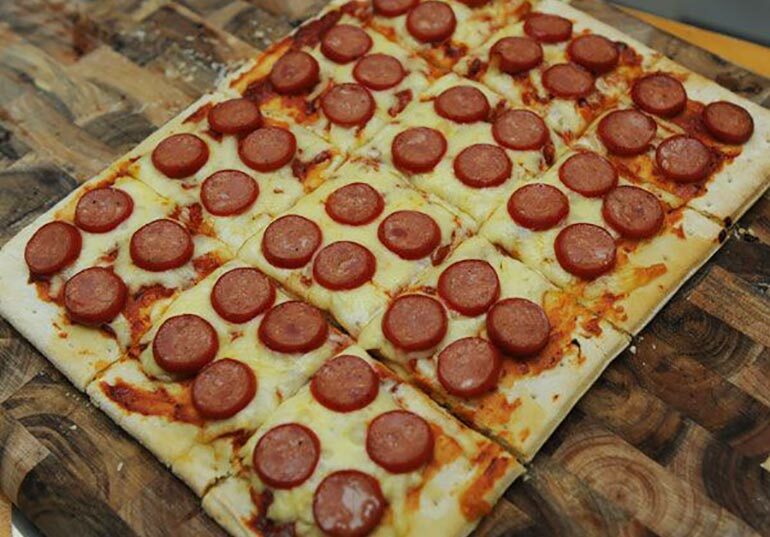 Nikki also pulled out Lego inspired pizza using thinly sliced cabanossi. What a super mum! 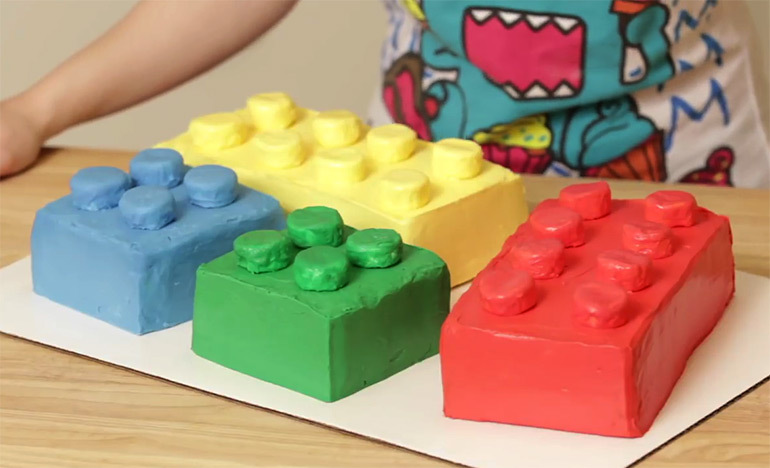 If your fondant skills leave a little to be desired, check out this Nerdy Nummies Lego brick cake tutorial. It’s SUPER easy and something even the most novice of cake makers can do. Promise. Now that you have the food sorted, here are a couple of fantastic decorating tips. Hang coloured cardboard behind the party food table and paint paper plates in matching colours to create a giant Lego blocks background. Clean out your giant Lego storage heads of random spare Lego bits, give them a nice soapy clean and use them to serve chips or bread rolls in. You can use coloured paper to cover square containers to tie them into the theme, just like you see here. Genius and so much fun! Want some more brilliant party themes to inspire? Check out these fun Diary of a Wimpy Kid party ideas.